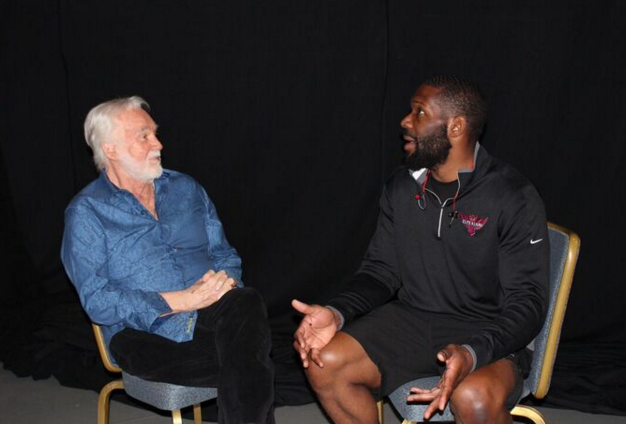 VERONA, NEW YORK (December 17, 2015) – After quoting “The Gambler” during the Bryant Jennings vs. Luis Ortiz, media conference call on Thursday, Dec. 3, Bryant “By-By” Jennings had the opportunity to meet Kenny Rogers today at Turning Stone Resort Casino. As luck would have it, Mr. Rogers is on tour and in town for one night only during the fight week of one of the most anticipated heavyweight matchups in the sport. Click HERE for photos of their encounter and a recording and transcript of the media conference call. Q: Now, I mean you’ve got a body that looks like it was chiseled out of marble, you’re a great athlete, but do you worry about maybe leaving it in the ring and overtraining ahead of the fight? BRYANT JENNINGS: No. That’s why I’m with top-tier trainers and things like that; we know ‘when to hold’em, we know when to fold’em’, we know when to pick it up and things like that, and that’s what makes the trainers great.